Why Shouldn’t I Declaw my Cat? For this edition, I’d like to take the time to answer the most common question that I have received over the past year or so. This question was asked by about 30 of our readers from the United States, Canada, and Europe. The question we are trying to answer is: What is the best way to deal with my cats claws? Is declawing a cat the right thing to do? Are there any alternatives to declawing my cat? Many of our readers ask this questions because they find that their cat will use furniture, carpet, rugs, or even wood trim as a scratching post. So if you don’t have a dedicated cat scratching post start by getting one! Many of our readers also say they are pressured by their family members to have their cats declawed so they can stop having their furniture or homes damaged by the darn cat! 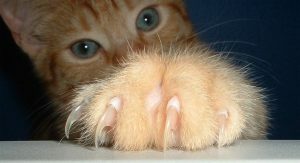 The answer to the age old question of how to deal with your clawing cat can be answered by another one of our veterinarian readers who suggests that declawing is not a natural thing for a cat and is distinctly different than trimming our (human) nails. Declawing has become one of the hottest debated subject among cat lovers, haters, and owers. Cats are born with claws for many reasons ranging from hunting, playing, and climbing. And because of these reasons they should keep their claws. Annie writes, that she would never have her cat or another cat declawed again. After she de-clawed her first cat she noticed a distinct change in the cats behavior including problems balancing stress, proper use of the litter box, substituting biting for clawing, and many more. She also writes that she was present for the surgery and that the process seemed painful for the cat. Furthermore, when declawing a cat, it is far more than just trimming their nails. The declawing process removes the section of bone from the cat’s paw where the claw would normally grow. To picture this on yourself would be the equivalent of having your fingertips chopped off. Make sure that the scratching post that you provide your cat offers many different materials such as wood, fabric, or other textures. Understanding the areas that your cat likes ensure the proper use of the post. This includes having both horizontal as well as vertical scratching options. Move the scratching post next to the areas where your cat is troubling your furniture. Give the cats an option between the naughty scratching area and the scratching post. You can even stack the deck in your favor by spraying or smothering the scratching post with catnip. If making the post more desirable doesn’t work try making the furniture or troubled area less desirable. Cats detest areas covered with clear masking tape. I am a strong advocate for trimming your cat’s nails as a last resort. If your cat is a friendly lap kitty, then this task may be a breeze. If your cat is not such a people person it may be a good idea to take them to the veterinarian and pay to have their claws trimmed. 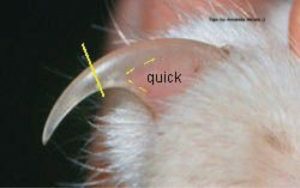 The benefits of trimming nails for your cat is to allow for the old claw tissue to be removed and regrown. If your cats nail tissue does not wear down and become replaced, the nail will grow into a very sharp spike causing nasty cuts to you and potentially your furniture and upholstery. Many other options exist including a kitty nail claw cap. If your cat doesn’t like its nails being trimmed, try adding a soft pad to cover the nail spike. If you’re like our reader Austin, his cat doesn’t like their paws being touched. This makes trimming the nails extremely difficult. The trick he learned from his veterinarian was to hold the cat and slowly massage the cats paws when the cat is on your lap. Feel the sharp tips of the nails by slowly pressing in the middle of the paw pad while you are massaging your kitties feet. As the nail is pressed outward, trim the clear section of the nail while leaving the pink area untrimmed. Be sure to reward your cat after you trim their nails so they remember it as a pleasurable experience. That way next time, it will be that much easier. Comments Off on Why Shouldn’t I Declaw my Cat? Many cat owners must decide whether or not to declaw their pets. Owners must realize that cat declawing is not a simple issue. Whether they realize it or not, there are short and long-term effects that declawing can have a cat. It is ultimately the owner’s decision, however, to weigh these issues and see whether or not declawing is necessary. Below are some of the issues that can be considered by cat owners. Keep in mind if your cat is causing you trouble you can always contact us to help you find a better home for it. First, it is important to consider what an Aby cat uses its claws for. They use them to mark their territory, and to survive. They also use them for their agility in jumping, chasing, and running. Their retractable claws help them establish good footing and balance. A cat will also use its claws for defense against predators. Often, an owner will only see a cat’s claws as the reason their sofa, carpet, or curtains are torn and ruined. When a cat is declawed, it is not as simple as cutting off its toenails. A cat’s claws are attached to ligament, tendons, and bones. Removal of the claws is likened to amputating each finger of a human hand. Similarly, declawing cuts off the first bone of each of the cat’s toes. It is also a very painful recovery for the cat since it walks on these now tender paws. There is no pain medication given to the cat afterward since cats do not tolerate them well – so every step it takes will produce pain for some time. Often, owners will note a psychological affect from declawing also. The once friendly, the playful cat will become quiet and aloof. Since declawing is an operation that requires anesthesia, complications from the procedure itself can arise. Although rare, infection, excessive bleeding, possible paralysis, as well as death from the anesthesia can occur. If not done correctly, there is also the possibility of the claw growing back abnormally, growing through the top or bottom of the paw. A cat’s whole defense system relies on its claws. Once declawed, a cat should never be allowed outside. If confronted, especially by another animal, a cat will claw or chase and run. When chasing and running, a cat relies on its claws. Without claws, it is unable to fight. You may honestly believe that since your cat is solely kept in the house, it will have no need for self-defense, and use this as an excuse to declaw. Unfortunately, even a house cat can get loose. You have now left your cat defenseless in the world. What chance would it have in the face of danger? The fact is that declawing is banned in many countries, as they consider it an inhumane procedure. Declawing does have alternatives though. Proper training of the cat will eliminate human scratching, as well as furniture scratching. To deal further with furniture scratching, buy a scratching post. Make sure the post is not made of carpeting, but rather of some material similar to the backing on carpeting. Also, be sure to trim the cat’s claws regularly as part of your routine cat grooming. This will enable you, the cat, and its claws to live in harmony.